Who loves you more than Scream Factory, seriously? These guys not only bring us some of the greatest Blu-ray releases of genre films that other companies wouldn’t touch with a ten-foot-pole, but they’re constantly doing things for the fans. Things like the Summer Of Fear activity, sales, giveaways, social events, all kinds of amazing things are happening this summer. We’ve already experienced a few of the Blu-rays that are part of the lineup, and now, Scream launches their Summer Of Fear drive-in, where they will be showing some of the movies they’ve released, for free, on their youtube channel, along with all-new interviews recorded with the filmmakers and actors. Tonight, they kick the series off with a free screening of Assault On Precinct 13, with breaks that will exhibit a recently-recorded interview with the living legend, John Carpenter. It doesn’t get much better than that. Stay tuned for more details about the Drive-in series, as well as reviews of all of the Summer Of Fear Blu-ray releases and more. The screening begins tonight, at 10PM EST. You can tune into the action here on their youtube channel, or you can visit the official Summer Of Fear website, for both the screening, and a look at some of the other cool things Scream Factory is doing for fans this summer, including huge discounts on some of their best Blu-ray releases. Isolated and cut off from the city, inside a soon-to-be-closed L.A. police station, a group of police officers and convicts must join forces to defend themselves against the Street Thunder gang, who have taken a blood oath to kill someone trapped inside the precinct. 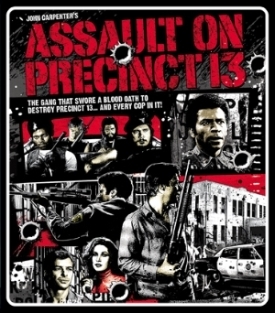 From John Carpenter (Halloween, The Thing and Prince Of Darkness),Assault On Precinct 13 combines the elements of a classic western and a modern thriller to create a riveting cult classic.